I could tell after one look at the Premium Edition of Persona: Trinity Soul that this series was not going to fit in among my shelf of anime DVDs. Literally. The Premium Edition of Persona: Trinity Soul throws in a hardcover artbook filled with episode summaries, character references, background art, mini-comics, and some Q&A with the creative staff. Flip the book over and it becomes an illustrated picture book referenced in the show. The artbook is visually impressive and helps make sense of the anime. The hiccup about the Premium Edition is that with the keepsake box housing the first 13 episodes of Persona: Trinity Soul in two DVD thin cases side by side with the artbook underneath, the result is an anime series that awkwardly sticks out from my DVD shelf. It would have been more practical for NIS America to use conventional DVD packaging for the anime series and include the artbook as a separate case for the Premium Edition so I could at least incorporate the book into my bookshelf of anime artbooks. At least both would fit into their respective shelves. While the packaging is different and a bit awkward, Persona: Trinity Soul as a show is familiar territory. A trio of brothers reunite in a city. While the oldest is investigating mysterious deaths as the police superintendent, the younger two adjust to their new schools, befriend quirky classmates, and get pulled into a rather dangerous school fad. Eventually the older brother's investigation intersects with the extracurricular activities of the younger brothers as the body count rises and the antagonists responsible for events gradually reveal themselves and their plans. Persona: Trinity Soul stems off the popular Persona JRPG series that I never really played since I was more into Disgaea. An anime based on a video game is usually a risky venture. Most of what makes the video game entertaining is the interactivity between player and game. Lacking that connection, the anime can feel like an extended cut scene. 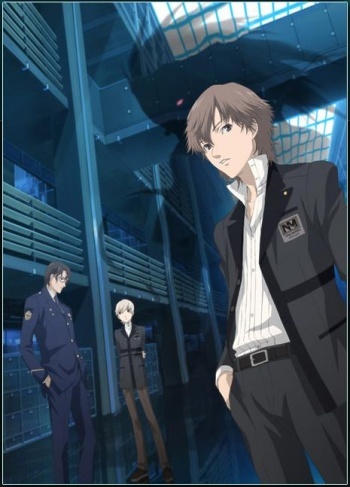 In this case, Persona: Trinity Soul is based around the Persona video game universe and is not based off one particular game. It sidesteps the issue of having to translate the gaming elements into the anime. Persona veterans and newbies alike are equally likely to follow what the story of Persona: Trinity Soul because hardly anything actually happens during the first half of the series. Yes, the episodes do a great job of establishing mood and developing characters. Yes, the animation and soundtrack are well done and fit the atmosphere. But since the story flows like frozen molasses in an unopened jar, patience in Persona: Trinity Soul wears thin very quickly. About the only thing that is quickly established in Persona: Trinity Soul is that each of the major characters possess a metaphysical manifestation of his or her own psyche known as a Persona that is used for combat against other Persona users. The introduction of the Personas is abruptly thrown in but handled well. Persona fans will already expect to see them as part of the franchise and those unfamiliar with Persona get to enjoy the ride as the characters try to uncover how they got them and what plans people have with them. The Persona combat is imaginative and visually pleasing, and the traits and looks of each Persona manage to match the personalities and subconscious of its respective user nicely. If I had not previously watched another ragtag group of characters with metaphysical manifestations of their psyches embark on a bizarre adventure, I would have been floored by Persona's unique concept. While the first half of Persona: Trinity Soul lacks a solid hook to get viewers interested in the anime, it does have a lot of potential given its characters and the story that is building up. Hopefully the training wheels of slow pacing will eventually come off and the battle between Persona users and the large conspiracy will finally come to play. Whether the series does reach its potential or stays stagnant throughout, I can admit that Persona: Trinity Soul has interested me in trying out the games. And one more thing: Persona: Trinity Soul avoids igniting the debate between the merits of English dubbed versus English subtitled by only providing the Japanese soundtrack with English subtitles. Recommendation: . Fans of the Persona video games are likely to get into the series, but they are also more likely to just play Persona instead of watching it. Tom Tonthat wonders if someone will make a MUGEN pitting Persona users against the Stand users of JoJo's Bizarre Adventure. Enter here to win your own copy of Persona: Trinity Soul or Toradora!